Over 250 years ago, Aleksandr Kerensky, Protector-General of the Star League, left known space. With him he took almost half the MechWarriors, BattleMechs and support personnel in the Inner Sphere. For 250 years, the Successor States have battled for supremacy. Technology has eroded, with both manufacturing capabilities and knowledge lost on the battlefields. The BattleTech Technical Readout: 3050 details all the new, state-of-the-art BattleMechs, both the improved Inner Sphere 'Mechs and those used by the Clans. Also incluided are construction rules for building new 'Mechs using the awesome new weapons, armour, and heat sinks that are available. Weighing in at 230 pages, this is perhaps the most substantial of the Tech Readouts issued by FASA. 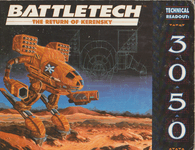 This original version includes more 'Mechs and rules than the later revised edition, as well as Record Sheests for Elemental units.